Pain is an unpleasant sensory and emotional experience associated with actual or potential tissue damage. Effective pain control during dental treatment of a pediatric patient is the most essential as it adjudges the behavior of patient for the rest of the appointment. The introduction of local anesthesia in 1844 has been a major contribution to dentistry. Since then, many new anesthetics have been developed, from the introduction of Cocaine local anesthesia in 1886, and the subsequent development of Procaine (1904) and other related ester-type anesthetics, dentistry has prided itself on being as close to as “painless” as possible. Initial amide local anesthetic, lidocaine (xylocaine), revolutionized pain control in dentistry worldwide. In 1969, Rusching et al. synthesized carticaine hydrochloride, with a chemical code name of Hoe 40 045, as the first amide-type drug with a lipophilic thiophene ring and an additional ester side chain. Carticaine became available for clinical use in Germany in 1976, and in 1984 was renamed articaine. In 2000, the US Food and Drug Administration approved the use of 4% articaine with epinephrine 1:100,000, and with epinephrine 1:200,000 in 2006. Owing to the presence of both amide and ester group biotransformation of articaine occurs in both the plasma (hydrolysis by plasma esterase) and liver (hepatic microsomal enzymes). Extraction is one of the most common procedures in dentistry that requires the administration of local anesthesia to make it a painless procedure. Inferior alveolar nerve block (IANB) has been the traditional technique for achieving anesthesia of mandibular teeth. However, its failure rate and associated complications such as lip biting or traumatic ulcer, especially in children pain, nerve injury, trismus, and rarely facial nerve palsy have resulted in need and quest for alternative local anesthetic techniques, of which intraligamentary injection technique is one. Intraligamentary technique (ILT) deposits 0.2 ml of the local anesthetic solution around each root of the tooth. It is administered in the vicinity of the tooth to be extracted so that the injury to the vital structures can be avoided. There is an immediate onset of anesthesia without any latent period, following which treatment can be started immediately without any delay. It also enables treatment of teeth in different quadrants during a single visit. Due to the short duration of anesthesia and the absence of numbness in the cheek, tongue, and lip area, the postoperative comfort is more when compared to conventional techniques. Keeping aforesaid facts in mind, the present study was aimed to compare the efficacy of intraligamentary injection technique using articaine and lidocaine for extraction of primary mandibular posterior teeth. The present study was conducted over a sample of 60 patients who reported to the Department of Pedodontics and Preventive Dentistry, for extraction of primary mandibular molars. Before conduction of study clearance from the Institutional Ethics Committee was taken. The sample size was calculated based on results obtained from previous studies of a similar nature.,,, The ILT was administered with medijectjet intraligamentary jet injector (Medesy, Italy) using cartridge containing lidocaine hydrochloride 2% with adrenaline 1:80000 (Lignospan, Septodont, France) and articaine hydrochloride 4% with adrenaline 1:100,000 (Septanest, Septodont, France) and a 30 gauge extra short disposable needle (Septoject, Septodont France). Children aged 6–10 years, whose primary mandibular molars were indicated for the extraction were selected and randomly divided into Group A and Group B. Children were selected using simple random sampling method wherein they were asked to select a ball from a container containing balls which were either blue or green in color. Those who selected blue balls were kept in Group A and ones who selected green balls were kept in Group B. Primary mandibular teeth requiring pulp therapy, as well as children with special health care needs, were excluded. Group B children received intraligamentary injection containing lidocaine. The injections were inserted through the gingival sulcus into the periodontal ligament. The bevel of the needle faced the alveolar wall. While penetrating the periodontal ligament, the tip of the needle passed along the root surface until it met resistance. Resistance to injection while the lever of intraligamentary injection was depressed indicated the correct location of the needle in the periodontal ligament, approximately at a depth of 2–3 mm. The angle of the bevel permitted insertion of the needle into the periodontal ligament to the required depth. The sites chosen for injection were the mesiobuccal, and distolingual aspects of the gingival sulcus. Deposition of minimum 0.2 ml left atrial (LA) was ensured at each of these sites. Fifteen seconds after the administration of LA the objective symptoms were checked using a blunt probe until maximum period of 30 s. It was marked as the onset of anesthesia. The profoundness of the anesthesia was assessed objectively while retracting the gingiva and during the application of forceps to the tooth. Sound eye motor (SEM) Scale was used to assess the pain at the time of injection, at the time of gingival retraction and at the time of extraction by an operator blinded to the study. After taking informed consent from the parents, extraction was carried out. If the patient experienced pain at any given time during the extraction, the procedure was abandoned and extraction was carried out after administrating routine inferior alveolar nerve and lingual block. Postextraction instructions were given to the patient and analgesic was prescribed to the patient. Antibiotics were prescribed if required. Space maintainer was given wherever required. Data recorded was transferred to excel sheet at the same time. Data were subjected to descriptive and analytical statistics using SPSS 16.0 software (IBM Corp., Armonk, NY, USA). Mann–Whitney test and Wilcoxon sign rank test were used to analyze the SEM score. The present study was carried out over a sample of 60 patients. Mean age of patients participating in the study was 7.8 ± 1.2 years. Distribution of patients in each group with different SEM score is shown in [Table 1] and [Graph 1]. 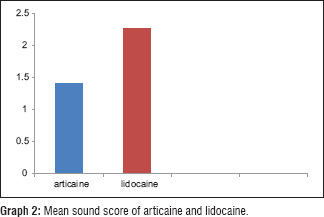 The mean sound score (±standard deviation [SD]) on the administration of lidocaine group (2.267 ± 1.55) was significantly higher than that of articaine group (1.4 ± 0.81). Difference between the two groups was statistically significant (P = 0.002) [Table 2] and [Graph 2]. 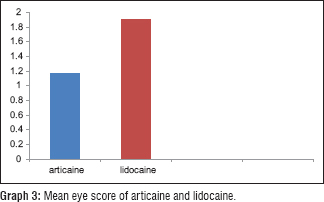 Similarly, the mean eye score (±SD) on the administration of lidocaine group (1.900 ± 1.45) was higher than that of articaine group (1.17 ± 1.09). However, the difference between the two groups was not statistically significant (P = 0.013) [Table 3] and [Graph 3]. 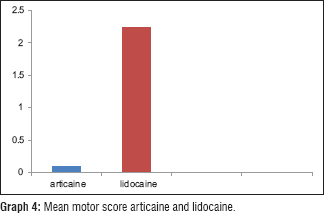 The mean motor score (±SD) on the administration of lidocaine group (2.233 ± 1.57) was significantly higher than the articaine group (097 ± 1.07). Difference between the two groups was found to be statistically significant (P = 0.000) [Table 4] and Graph 4]. Out of 30 patients each in articaine and lidocaine group, extractions were carried out successfully in 27 and 18 cases, respectively. Effective and local management of pain in dentistry is the most important aspect of patient care by helping to ensure patient comfort and reduce operator stress. About 5%–25% of patients avoid dental treatment because of injection phobia. IANB is mostly used for anesthetizing mandibular posterior teeth, for various dental procedures. Even after a proper technique, the failure of IANB at the pulp level can be observed. The percentage of failure of IANB reported in the scientific literature is extremely variable, ranging from 3.2% to 88%. According to Kaufman et al. in a survey of 93 general practitioners anesthetic failure occurred in 13% of injections overall, with the greatest number of failures (88%) occurring with the IANB. Pogrel and Thamby in a prospective study for evaluating permanent nerve damage after IANB concluded that an IANB could cause occasional peripheral nerve damage. A number of mechanisms have been suggested as conditions that could alter the efficacy of IANB, such as anatomical variations, accessory innervation of the posterior mandible, the decrease of local potential hydrogen due to infection, and local activation of nociceptors. Several alternatives to the IANB are available of which intraligamentary is one. In the present study, we compared the effectiveness of two anesthetic agents using ILT for extraction of primary mandibular molars. 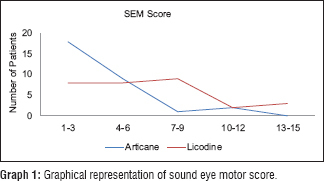 SEM score scale was used to evaluate the efficacy of articaine and lidocaine. Articaine showed a better result in achieving anesthesia by ILT than lidocaine. The higher failure rate was found in lidocaine group as compared to articaine group where some cases required administration of IANB for anesthesia to complete extraction. The higher success rate of articaine could be attributed to higher lipid solubility and higher plasma protein binding property as it has both ester and amide group. Therefore, articaine has gained popularity in the dental market of many countries, despite the gold standard status of lidocaine. Arrow in his study concluded that analgesia success for buccal infiltration with articaine was 71%; lidocaine was 64% though there was no statistically significant difference. Ram and Amir compared articaine 4% with 1:200 000 epinephrine and lidocaine 2% with 1:100 000 epinephrine and concluded that articaine was found to be more effective with the longer lasting effect of numbness. Leith et al. advocated articaine to be a safe and effective alternative to lidocaine for use in children. Adewumi et al. found prolonged numbness to be the most adverse event and occurred primarily in children younger than 7-year-old, parents need to be informed and reassured accordingly. Mittal et al. in their study comparing the anesthetic efficacy of articaine and lidocaine during primary maxillary molar extractions in children concluded that buccal infiltration with articaine failed to provide adequate palatal anesthesia. Results obtained from the present study were in concurrence with the results of a study by Prama et al. and Pradhan et al., where they reported that pain during needle penetration was less in ILT as compared to IANB. Results obtained from the present study were in concurrence with the results obtained from study conducted by Kämmerer et al. who compared intraligamentary anesthesia (ILA) and IANB for extraction of posterior mandibular teeth and concluded that ILA fulfills the requirements of a minimally invasive and is patient-friendly local anesthetic technique so it represents a safe and reliable alternative to IANB for extraction of mandibular posterior teeth. Shabazfar et al. in their meta-analysis on the literature from 1979 to 2012 on periodontal intraligament injection as an alternative to inferior alveolar nerve block and concluded that except for cardiovascular disturbances ILA is neither superior nor inferior compared to IANB. Lalabonova et al., in their prospective study on 220 general dental practitioners to evaluate the use of ILT showed that 75.91% Bulgarian dental practitioners use ILT in almost all treatments in which 32.94% showed adequate anesthesia. Froum et al. evaluated histologic changes in intraligamentary injection and concluded that ILT caused minimal damage to the periodontal ligament. One of the disadvantages of the ILT, as stated by Froum et al., was that after 24 h of injection, little-localized inflammation was present in the periodontal ligament, but it subsided by a week and periodontal ligament appeared normal. Thus, it was concluded that damage to the periodontal ligament by ILT is minimal. ILA with articaine due to its several advantages calibers serious consideration. The method offers fast-acting, effective anesthesia-free of side effects. The ILT also permits treatment of teeth in different quadrants of the mouth at the same visit. Therefore, complications and difficulties stumble across with infiltration and block anesthesia may be avoided. Limitation of this study could be attributed to the relatively smaller sample size. It needs to be conducted on more number of patients. The clinical procedures were done by a single operator thereby possible operator bias. Within the limitations of the present study, it can be concluded that ILT with articaine can be an alternative to IANB for extraction of primary mandibular molars. Therefore, the decision to use articaine cannot be based on any convincing evidence of superiority over lidocaine; rather the choice will be based on the personal preference and experience of the individual clinician. Second YK, Neelakantan P. Local anaesthetics in dentistry: Newer methods of delivery. Int J Pharma Clin Res 2014;6:4-6. Kaufman E, Galili D, Garfunkel AA. Intraligamentary anesthesia: A clinical study. J Prosthet Dent 1983;49:337-9. Malamed SF, Gagnon S, Leblanc D. A comparison between articaine HCl and lidocaine HCl in pediatric dental patients. Pediatr Dent 2000;22:307-11. Shabazfar N, Daubländer M, Al-Nawas B, Kämmerer PW. Periodontal intraligament injection as alternative to inferior alveolar nerve block – Meta-analysis of the literature from 1979 to 2012. Clin Oral Investig 2014;18:351-8. Endo T, Gabka J, Taubenheim L. Intraligamentary anesthesia: Benefits and limitations. Quintessence Int 2008;39:e15-25. Pradhan R, Kulkarni D, Shetty L. Evaluation of efficacy of intraligamentary injection technique for extraction of mandibular teeth-A prospective study. J Clin Diagn Res 2017;11:ZC110-3. Arrow P. A comparison of articaine 4% and lignocaine 2% in block and infiltration analgesia in children. Aust Dent J 2012;57:325-33. Ram D, Amir E. Comparison of articaine 4% and lidocaine 2% in paediatric dental patients. Int J Paediatr Dent 2006;16:252-6. Mittal M, Sharma S, Kumar A, Chopra R, Srivastava D. Comparison of anesthetic efficacy of articaine and lidocaine during primary maxillary molar extractions in children. Pediatr Dent 2015;37:520-4. Nayak R, Sudha P. Evaluation of three topical anaesthetic agents against pain: A clinical study. Indian J Dent Res 2006;17:155-60. Potocnik I, Bajrović F. Failure of inferior alveolar nerve block in endodontics. Endod Dent Traumatol 1999;15:247-51. Janjua OS, Luqman U, Ibrahim MW, Shah I. Transpapillary versus palatal injection technique for maxillary tooth extractions. J Coll Physicians Surg Pak 2012;22:143-6. Kaufman E, Weinstein P, Milgrom P. Difficulties in achieving local anesthesia. J Am Dent Assoc 1984;108:205-8. Leith R, Lynch K, O'Connell AC. Articaine use in children: A review. Eur Arch Paediatr Dent 2012;13:293-6. Adewumi A, Hall M, Guelmann M, Riley J. The incidence of adverse reactions following 4% septocaine (articaine) in children. Pediatr Dent 2008;30:424-8. Prama R, Padhye L, Pawar H, Rajput N. Efficacy of intraligamentary injections as a primary anesthetic technique for mandibular molars and a comparison with inferior alveolar nerve block. Ind J Multidisc Dent 2013;3:1-5. Kämmerer PW, Adubae A, Buttchereit I, Thiem DGE, Daubländer M, Frerich B, et al. Prospective clinical study comparing intraligamentary anesthesia and inferior alveolar nerve block for extraction of posterior mandibular teeth. Clin Oral Investig 2018;22:1469-75. Lalabonova H, Kirova D, Dobreva D. Intraligamentary anaesthesia in general dental practice. J Int Manage Accredit Board 2005;11:22-4. Froum SJ, Tarnow D, Caiazzo A, Hochman MN. Histologic response to intraligament injections using a computerized local anesthetic delivery system. A pilot study in mini-swine. J Periodontol 2000;71:1453-9.